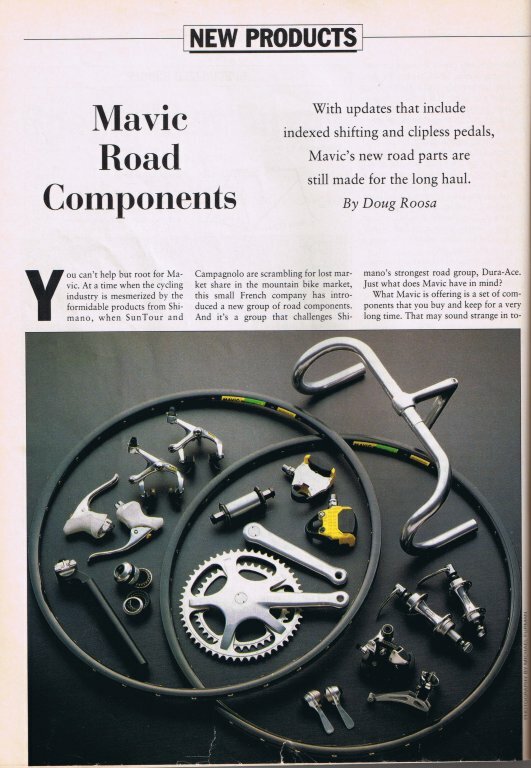 1989 saw massive changes to the Mavic component lineup. 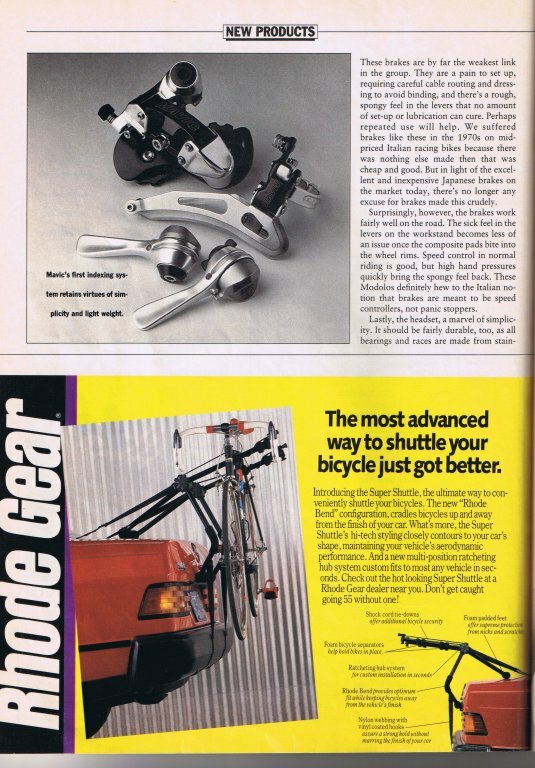 Gone were the Campy knockoff cranks, old-style Modolo brakes, Simplex shifters and erector-set style derailleurs. 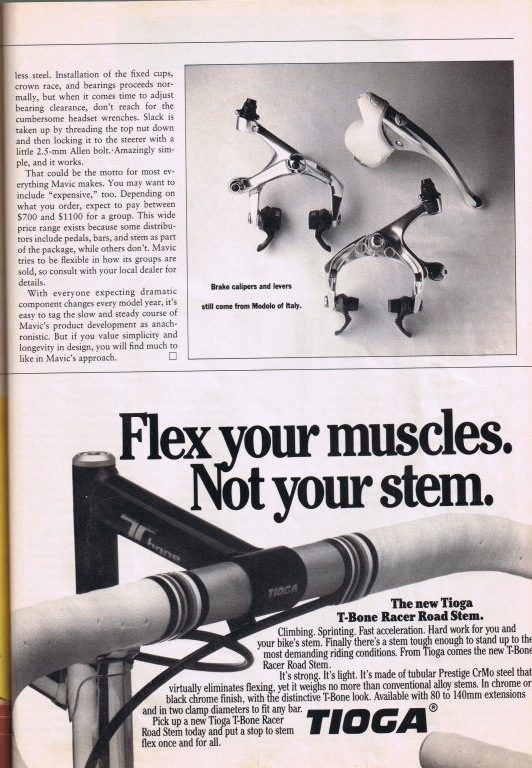 In their place were the sleek lines of the 631 "starfish" crank, the crisp indexed shifting of the 840/841 derailleur and 821 shift levers, and the aero stylings of the 440 brake. Sticking around, for the time being, were the venerable 501 hubs and 860/862 front derailleurs. Not the lightest group around by any stretch, but solid, dependable, and like all things Mavic, rebuildable. It might not retain the quirky personality of earlier Mavic goods, but it still shows off the designed-to-last mentality Mavic was known for. 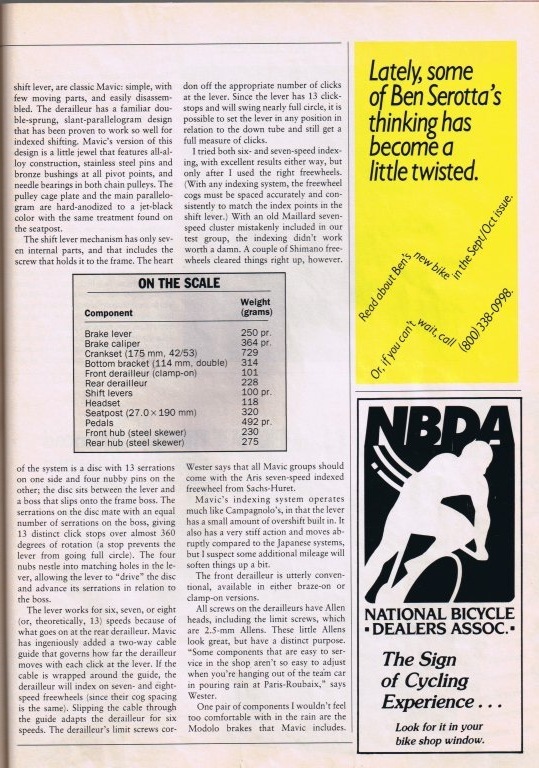 Here's what Bicycle Guide had to say about it in August of 1990. Enjoy! The hubs were phenomenal as we all know and proved a point that Shimano and Campy still have no clue as to how to make a a durable and fast hub in the modern age. The HS was quite good until the Campy record/ chorus cam out still a good choice today as a replacement. 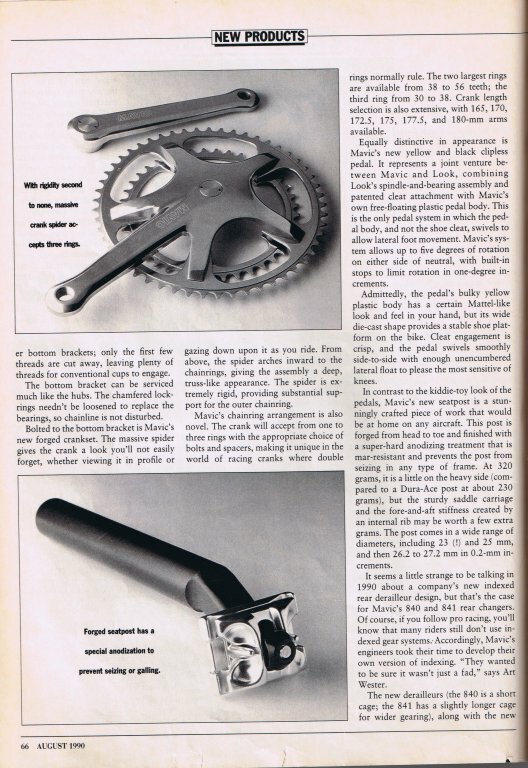 cranks were the stiffest ones you could get and still hold true over some of the external BB options. the rear der though no visual character or vast metastability quite good for index systems of the time (suntour, campy, shim)breaks at the time were still made by Modolo the next year they went to Diacomp they worked a tad better though not as good as Chours monoplanes. the seat post was the biggest stand out being hard annoed it was nearly imposable for it to seize in a frame of the time. Quote: "Not the lightest group around by any stretch, but solid, dependable, and like all things Mavic, rebuildable. It might not retain the quirky personality of earlier Mavic goods, but it still shows off the designed-to-last mentality Mavic was known for." Absolutely spot-on. I bought a NOS 840 rear mech 9 years ago for cyclo-cross racing. Still going strong despite all that mud, water, grit and general punishment, albeit now on to its third set of jockey wheels! And from recent evidence of last autumn's 'cross racing, more reliable for off-roading than the latest state-of-the-art 10sp and 11sp rear mechs. The updated Mavic Tech Manual (white cover) by Adam Micklin was released in 1991. 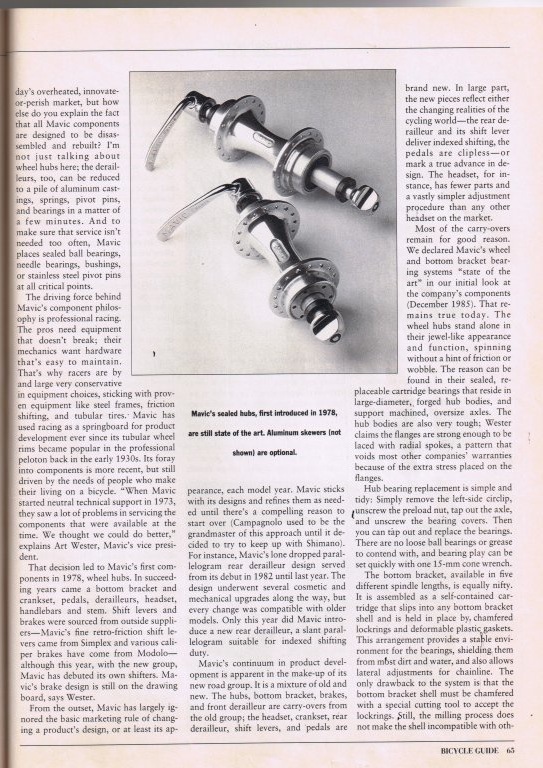 Despite the magazine article, the production brakes were made by Dia Compe, NOT Modolo.